Once your Fibers have been generated as a FiberMesh it is possible to generate UVs. The same UV map will be assigned to each individual Fiber, allowing you to apply a texture to all of them. This provides additional possibilities for the look and style of your Fibers, especially when using them to create complex plants. Due to the large amount of memory required for these UVs, this feature isn’t automatic. Even though it’s the same map for all Fibers, these UVs must still be associated with the individual vertices. When you have hundreds of thousands of Fibers (usually with many polygons each), that can become an exponentially large amount of data! 1. Create your Fibers. For the memory reasons explained above, try to use a low Max Fiber setting. 2. 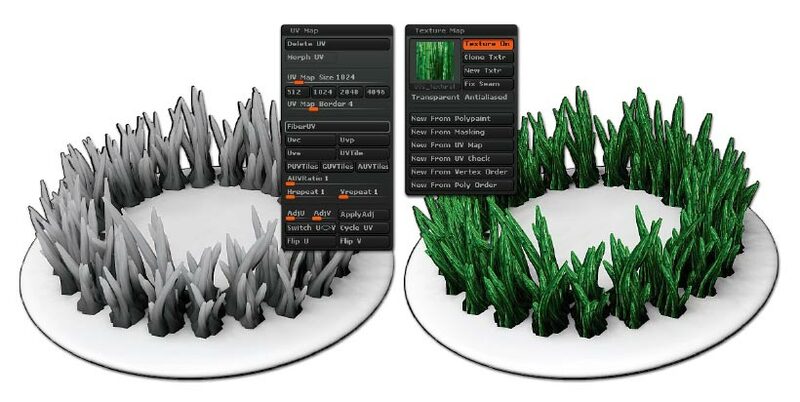 By default, ZBrush will advise you to use Preview mode. In order to preview textures, however, it is not recommended to use this mode. 3. Once your FiberMesh has been created, select its SubTool. 4. Go to the Tool >> UV Map sub-palette and click on FiberUV to generate the mapping. Your UVs will automatically be “per Fiber” which means that all Fibers will share the same UVs. This button is enabled only when a SubTool composed of Fibers is selected. Note: If the button is grayed out while having a SubTool composed of Fibers selected in the SubTool sub-palette, it’s because you have modified the Fibers topology and transformed them to a default Polymesh3D. Operations like Slice Curve or applying a subdivision-level transformation to the FiberMesh topology will cause this to happen. 5. In the Tool >> Texture Map sub-palette, select the texture of your choice. Note: You can use a texture with pure black color to define transparency. The Fibers will be rendered corresponding to this transparency information. Keep in mind, however, that the transparent portions of the Fibers will still cast shadows just as if they didn’t have transparency.